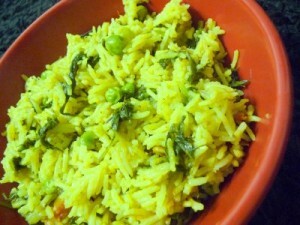 Spicy Green Rice recipe by Nazia Nazar at DesiRecipes.com. Add oil to the pan, add cloves, cardomom, cinnamon , javitri and saut them. Later add ginger and garlic paste and sautC for few seconds. Later add the chopped onions and green chilies and saut them till the onions become transparent. Then add the green leafy paste to the pan, mix well, allow it to cook for few minutes until the boils appear. Later add the rice and mix well. Then add water, salt and mix well and cover the pan with a lid. Allow it to cook, after the rice is cooked, garnish it with coriander.